Seizures and epilepsy in BBS are considered an uncommon occurrence. Careful examination of CRIBBS reveal that more than 12% of individuals with BBS experience seizures while nearly 10% are identified to have epilepsy. Many individuals begin with seizures early in life but outgrow the need for medications by adulthood. This information will be presented at the American Epilepsy Conference in Houston, Texas in December 2016. 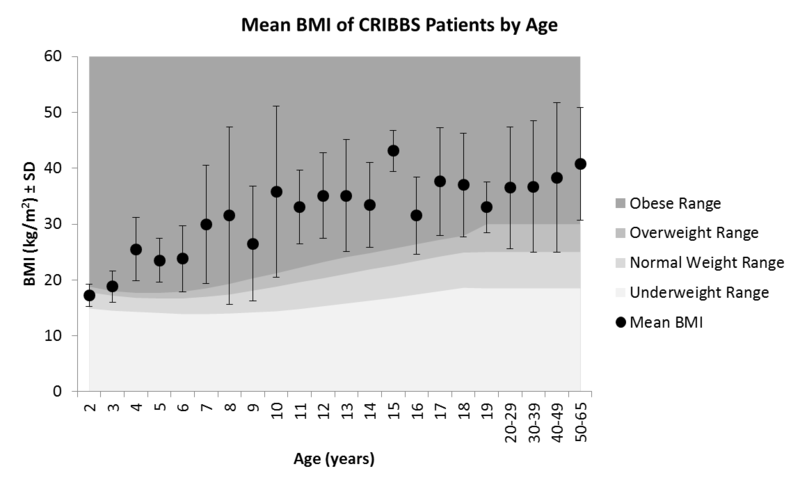 Obesity remains a serious health issue for many individuals with BBS. The graph below shows that obesity begins early in life and for many it persists throughout life. The Marshfield Clinic is working with both industry and other researchers to identify safe and effective treatments using behavioral therapies as well as medications to treat obesity. Ongoing information on our efforts will be provided as the studies move forward.